Devonshire House care home in Cavendish which used to be the family home of Sue Ryder has dedicated a room in her memory. At a private ceremony on Saturday (2 February), carers at Anchor’s Devonshire House in the High Street were joined by members of The Lady Ryder of Warsaw Memorial Trust (LRWMT) and her son Jeromy and daughter Elizabeth for the official opening of the Remembrance Room. Staff have been working with the Trust to include items which celebrate the life of Lady Ryder whose bravery and determination saved the lives of many survivors of the Nazi concentration camps in Poland and helped sick and disabled people. 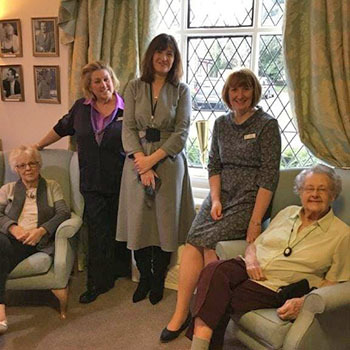 Karen Curle, Manager of Anchor’s Devonshire House, said that staff at the home were proud of its connection with Lady Ryder. She said: “This important event will highlight Lady Ryder’s courage and hard work to help the death camp survivors try to reclaim their lives in the beautiful grounds which include rose gardens and a lake where they used to fish. The event will also serve as a reminder to people more than 80 years on the horrors of the concentration camps. It follows a study to mark Holocaust Memorial Day last month which found that 5% of adults in the UK don’t believe the Holocaust took place and one in 12 believes its scale has been exaggerated. LRWMT Trustee Michael Cutting said he was delighted the room had been dedicated to Lady Ryder. He added that in the building there was a small flat upstairs where Lady Ryder and her husband Group Captain Leonard Cheshire VC lived, in great simplicity, with their two children. Mr Cutting added: “The first patients who came to the home were survivors from the concentration camps of the Second World War who were brought to Cavendish by Sue Ryder herself. Anyone wanting to find out more about Devonshire House, can phone 0800 731 2020.